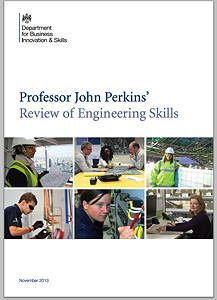 The Review of Engineering Skills, written by Professor John Perkins, the chief scientific adviser to BiS (the Department for Business, Innovation and Skills), calls on the government and the engineering community to inspire future engineering talent and address the shortages. It sets out plans for the government to work with educational institutions and industry to improve engineering education. The review endorses the view that increasing the supply of engineers entering the labour market would benefit the UK economy, helping it to become more flexible and resilient, and enabling more people to take up the new opportunities that technological change presents. The review includes 22 recommendations for action by government, industry, the engineering profession, and the education sector. It draws attention to the low number of women entering engineering in the UK, especially compared to its European rivals. • a portal on the National Careers Service Web site, matching businesses that want to promote engineering careers in schools with organisations who can deliver educational outreach activity. “Engineering has a vital role to play in the future of UK industry,” says business secretary, Vince Cable. “It is important that we act now to ensure businesses have access to the skills they require to enable them to grow. We cannot do this alone, so I am calling on employers and education professionals to get involved and inspire the next generation of engineers.